The Costa Rica Convention Center (CRCC) is an advanced eco-friendly architectural work inspired by Costa Rican biodiversity, culture and authenticity. The design was conceived to offer unique experiences for visitors in a sustainable, modern and versatile fashion. The CRCC is a country project to meet the demand of business tourism in providing room and better conditions to host and conduct both national and international conferences, conventions and social events.  With this work, Costa Rica aims to leverage their business strengths and become a leading convention destination in the region. “The Drum” is a perfectly designed vertical item in harmony with the horizontal construction. The oval represents flora and fauna –Costa Rica’s most notable feature. Solar panels, stone spheres, wood details, perforated metal, translucent windows and other features account for eclectic architecture. Indoor natural light, surrounding trees and settling basins account for the project sustainability. exhibition of Costa Rican modern art. 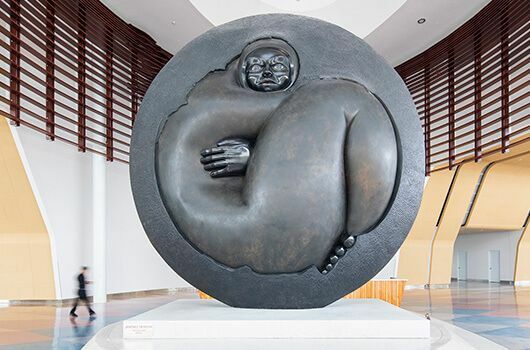 Named “Evolution,” it was made by internationally renowned Costa Rican sculptor Jorge Jiménez Deredia. Such an experience is complemented with the colors of a typical oxcart wheel at the feet of visitors. Colors red, blue and orange burst on the floor, dying the foyers. 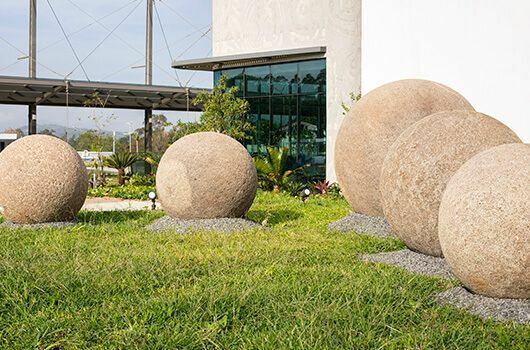 Our five pre-Columbian stone spheres –mounted on a 60cm natural base– are symbols that represent Costa Rican idiosyncrasy, culture and history. They are our past and were declared a World Heritage Site in 2014. 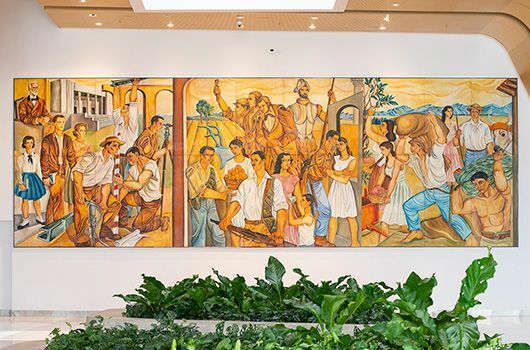 The Second Republic Wall Painting made by Lucio Ranucci in the 50s praises the values of our society – with education, public works, agriculture, and family scenes on the edges. This contemporary heritage work was exhibited at the former “El Coco” International Airport. We partner with our customers, with professionalism and dedication, to develop eco-friendly and perfect events to meet their goals, exceed their expectations and create a memorable experience for their visitors. We will be a leader in Latin America in terms of service excellence, operational effectiveness and sustainability, through dedicated human talent promoting ongoing innovation in our processes. The Costa Rica Convention Center is part of the International Congress and Convention Association (ICCA) representing suppliers from all over the world in handling, transporting and accommodating international meetings and events. It comprises over 1,100 member companies and organizations in almost 100 countries worldwide. 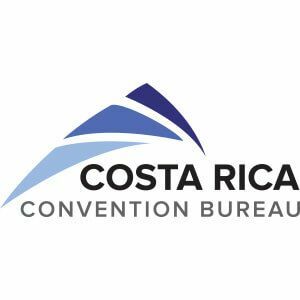 The CRCC is also a member of Costa Rica Convention Bureau, a non-profit organization dedicated to developing promotional actions in target markets in order to position Costa Rica as a MICE destination. It comprises over forty-five top hotel companies specializing in handling destinations, attractions and supporting services. 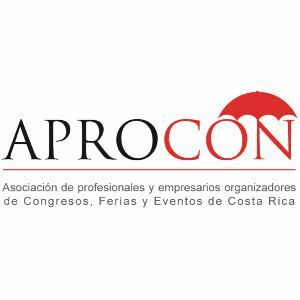 We are also a member of APROCON, the Costa Rican Association of Meeting Industry Entrepreneurs and Professional Congress Organizers. It is the leading body for the economic activity developed by the Congress and Convention industry nationwide. 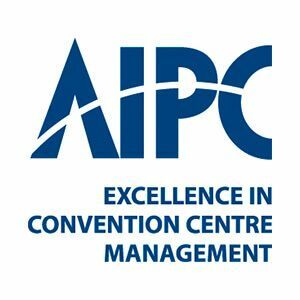 AIPC is an international association of convention centers. Its mission is to encourage, support and recognize excellence in convention center management. It also recognizes and promotes the essential role of the international meetings industry in supporting economic academic and professional development as well as enhancing global relations amongst highly diverse business and cultural interests. 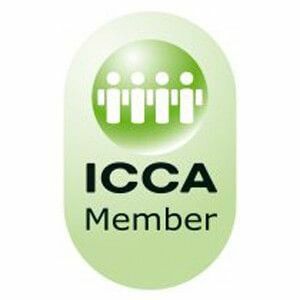 AIPC represents a global network of more than 185 leading centers in 60 countries with the active involvement of more than 900 management-level professionals.